Fitz & Floyd, Fine Ceramic, "Midnight Rose" Pattern, Made from 1987 thru 1988 only - Two Pieces, including lid. This is a Lovely Black Ceramic Six Cup Size Teapot by Fitz and Floyd, called "Midnight Rose". It is in the Globe Shape, with Raised Red and Pink Roses on Both Sides, and Rosebuds as the Knob to Lift the Lid. 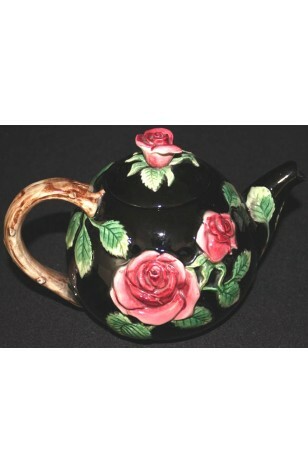 The Handle of the Teapot is Brown in the Shape of a Rose Branch, and the Leaves are Shades of Green. Excellent condition and just beautiful. This is a Lovely Black Ceramic Six Cup Size Teapot by Fitz and Floyd, called "Midnight Rose". It is in the Globe Shape, with Raised Red and Pink Roses on Both Sides, and Rosebuds as the Knob to Lift the Lid. The Handle of the Teapot is Brown in the Shape of a Rose Branch, and the Leaves are Shades of Green. Very Good Resale Condition unless noted below or in pictures. Just absolutely beautiful..